2 September, Durban: In a press conference today, the Global Forest Coalition (GFC)  highlighted the need for governments to provide policy support for indigenous communities to conserve forests and other ecosystems that form part of their territories. Their role is seldom recognized, and often their livelihoods and territories are threatened by government supported extractive industries like mining, pulp/paper, timber and biofuel monoculture plantations. GFC warns that the upcoming World Forestry Congress  being hosted by the South African government from 7-11 September in Durban might end up doing just that. It could give a major push to the timber and biofuel industry, leading to a growth in industrial monoculture tree plantations of eucalyptus, acacia, pine, rubber and palm oil. The crux of the problem lies in FAO’s  faulty definition of forests, informs GFC. Presently, FAO accepts monoculture timber plantations as a forest, what they call “planted forests”. But the problem with these fake forests, as GFC activists termed them, is that they replace ancient real forests, directly causing deforestation. Fake forests are incapable of doing the things real forests do—purify air, and provide water, shelter to many species, medicine and food for people. “One of the main threats to South Africa’s biodiversity are industrial timber plantations of alien species like eucalyptus and pine that have destroyed millions of hectares of biologically unique grasslands and local trees. They also over use water, silt up rivers, killing fish, destroying the livelihoods of local communities,” highlighted Philip Owen from the community-based organization GEASPHERE from de Houtbosloopvalley in Mpumalanga during the press conference. As part of a worldwide assessment of the resilience of community conservation , GFC has brought over 100 representatives of local communities, indigenous peoples and allied groups to Durban for the Fostering Community Conservation Conference  The assessment shows that supporting indigenous communities’ rights over their territories, especially land tenure, is one big way to prevent encroachment by extractive companies. Across the world, indigenous communities show great motivation and are at the heart of the battle to protect local habitats like forests, “Humans don’t own the land but they are part of it. 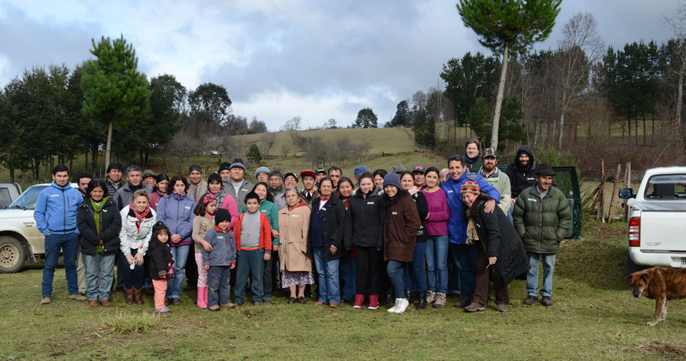 Our struggle is to end the destruction of nature, the alien trees and monocultures that invade our lands,” said Francisco Manquecheo Agregan of the Mapuche people in Chile. Global Forest Coalition is a worldwide coalition of almost 80 NGOs and indigenous peoples’ organizations from 40 different countries striving for rights-based, socially just forest conservation policies.